Last week the second part of Budget Day was the Capital Funding proposals as set out by the Administration. We put forward an amendment to the motion whereby we requested that it was put to the Scrutiny Committee to be, yes you guessed it, further scrutinised. Predictably the SNP-Labour coalition did not want further scrutiny and voted for the motion. The Capital Fund is effectively a 10 year plan and is where big money is spent on key projects such as school buildings, traffic management, libraries, museums, refurbishments of Council buildings, property maintenance and leisure facilities. However, whilst it deals with large sums of money we wanted more scrutiny as there just isn't the detail on the papers issued. 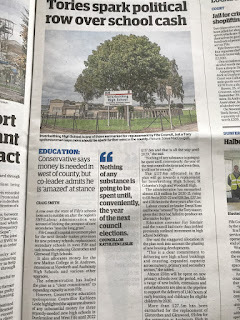 Secondly, whilst huge numbers of money - such as £117million for the the school estate in West Fife, appear the detail often tells quite a different story when it comes to timescales and what and what not will get done. I commented on the school estate (school buildings - renewals, replacements and extensions) as I am particularly concerned that despite grand promises from the SNP-Labour Administration, there is unlikely to be any new high schools in West Fife in the coming years. The money simply isn't there. Unsurprisingly I have noted over the past few days a sudden flurry of social media activity around some groups in the Dunfermline and West Fife area as the Administration's Capital Fund proposals for the school estate were released. Predictably, there was a positive spin put on this by some members in this Chamber. However, it didn’t really take too long to look at the spreadsheet and realise that despite the puffed-up figure of £117m being proclaimed that there was a fair bit of smoke and mirrors. Dunfermline and West Fife high schools, the subject of much virtue-signalling during election campaigns in Dunfermline. In 2017 both Labour and the SNP claimed in their election literature that if you voted for them you would get new high schools in Dunfermline. Given the long-running blame game in the years prior to the Council election between the 2 parties, it must have seemed like a win win to the people of Dunfermline and West Fife when the 2 former rivals established their cosy coalition. Now there would be no more bickering and blame. Just new high schools and pretty much immediately. Inverkeithing, Woodmill & St Columba’s are now all listed as both Condition and Suitability C. Woodmill’s 2 upper floors have no accessible toilets and the medical room is completely inaccessible to anyone in a wheelchair. Inverkeithing cannot go above 90% capacity due to issues with encapsulated asbestos and only 2 weeks ago it had to close due to water supply issues. Which I noted the current MP stated means “the time to act is now” to have a replacement built. It’s a shame she didn’t do something about it when she was a councillor. 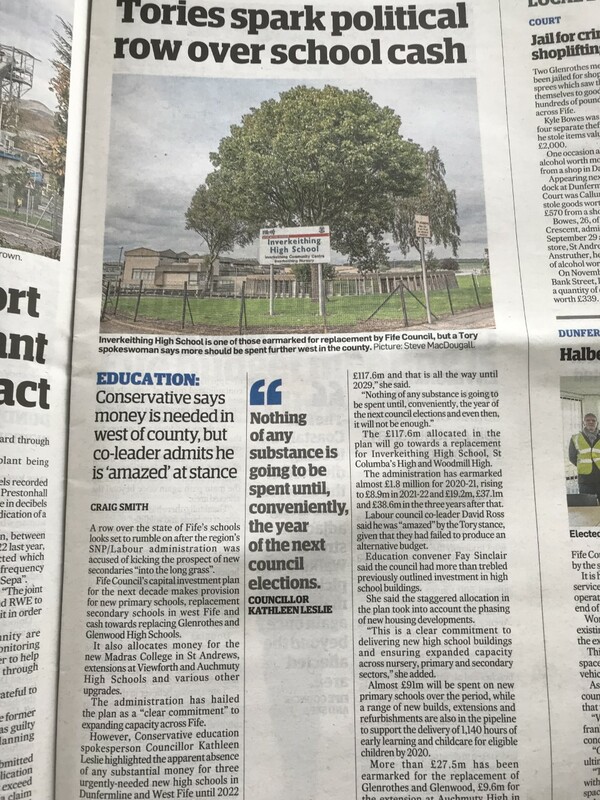 I also note that Cllr Ross has stated in today's Dunfermline Press that "we've delayed plans for these new schools over the past few years", indeed you have! Are these schools really the environment the young people of Fife should be taught in? Let us though look at the data here. In another bumper packed set of papers the November Education & Children’s Services Committee told us that to get the 3 replacement schools in Dunfermline, the soon to be required extensions on DHS and QAHS and Glenwood and Glenrothes replaced, the grand total would be £226m. And what of Glenrothes and Glenwood. Well and truly punted into the long-grass. 2 schools, both in Condition C and yet the first pennies will not be available until far off in 2025. Maybe new high schools are not considered to be a deal maker in elections in Glenrothes. “There is £50million in the Captial Plan” – yes, that is what we keep getting told. We have been reminded of this so, so often. That just leaves a gap of £176m for the rest. However, no-one should have felt disheartened as there was also the announcement that the SNP Government would be sinking £7billion into “innovative projects”. What wasn’t included was that there is no further Scottish Government funding projects for school buildings across Scotland during the remainder of this Parliament. So, we have this £117m for West Fife. What has unfortunately been missed out is that the £117m is a grand total of Capital funding on the school estate for West Fife secondary schools until 2029. I find it quite incredible that given all the fan-fair about this money that in 2020-2021 there will be £1.781m available which will increase to a further £8.883m the following year, still just not quite enough to build one new high school. However, in election year £19.2m is pledged! Now that will make for a great pre-election story. Sadly though, it still will not be enough. The big numbers conveniently do not begin until 2023-2024. By which time of course Ruth Davidson will be in Bute House and there will actually be a Scottish Government that works for the people of Scotland. Therefore by 2029, almost 2 decades after promises began to be made by one time SNP and Labour rivals, there just might be 3 new high schools in Dunfermline and West Fife. I was also intrigued to note that money will become available in 2021 for an extension to Viewforth. Only just opened in 2016 and an extension is going to be needed. Talk about poor planning on the part of the previous Administration. Did no-one look at the fact the town was growing and quite possibly consider that would lead to a need for increased capacity? No, so instead money will now have to be found to extend a school that has only been open for three years! This Capital Funding plan for the school estate is a disgrace. It is a further set of broken promises. This plan needs more scrutiny. Therefore, I support the Amendment. Yesterday Fife Councillors set the budget for the year. This saw a 3% increase on the Council Tax and cuts across other vital services. This budget was voted for by the SNP-Labour Coalition. The Conservative group put up an amendment looking at some ways to outsource as a means to reduce the deficit and protect vital services. We were however, not allowed to provide figures on our outsourcing proposals which made the whole process very frustrating. We believe though that as the Council is already outsourcing around 88% of its care home provision (which works), then there is no reason why other smaller services should not also be looked at. Unfortunately, due to punitive cuts by the SNP Government, despite the Block Grant from the UK Government rising by 1.8%, local authorities are facing very difficult choices. Scotland is now the highest taxed part of the UK and with the SNP Government passing a Holyrood budget that could see workplace parking charges become a reality, this is very worrying for hardworking people in Scotland. It also leaves little incentive for people to be attracted here to settle and work. We have had 12 years now of mismanagement of the Scottish economy by the SNP and huge cuts to local authorities are very concerning. 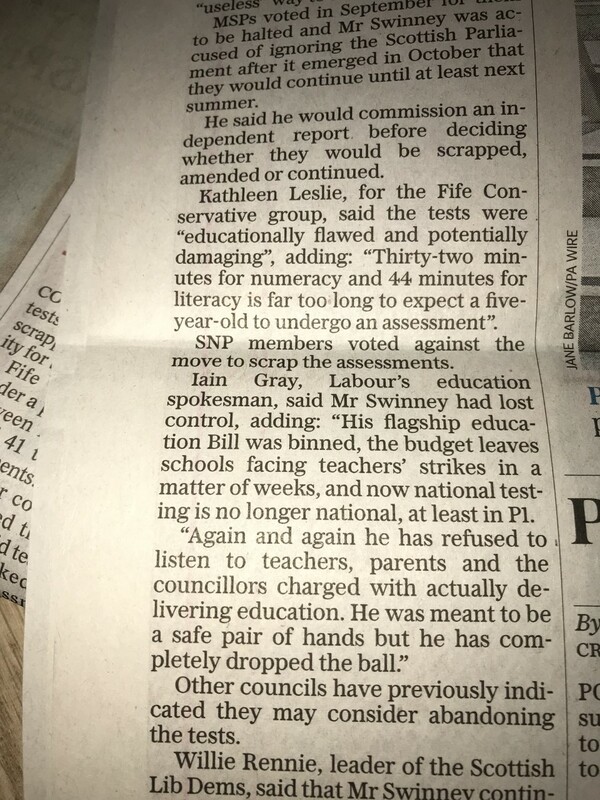 I was particularly concerned about implications of a £1.489m cut to Education in Fife. Yesterday I spoke out against this at the Council meeting. Below is the text of what I said (it can also be found on the link I shared on my Councillor Facebook page yesterday). I also spoke at Council on the need for further scrutiny of the Capital Fund and will post that on here later today. 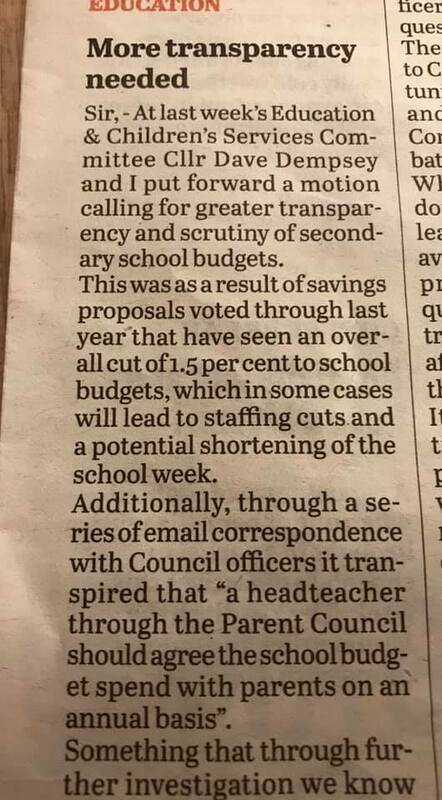 Following cuts to last year’s Education budget I was surprised and shocked to see that this SNP-Labour coalition, despite petitions from teaching staff, parents and the Unions, had decided to impose further aggressive and damaging cuts, particularly, to secondary schools. This cut will amount to £750k over the course of a year. You can dress it up in any terms you like but this sort of “efficiency” will impact and it will impact negatively. Across the country local authorities are facing damaging cuts all as a result of this SNP Government’s complete mismanagement of the economy over the past 11 years. Despite a 1.8% rise in the Block Grant, we are facing more punitive cuts to vital services such as health and education. Here in Fife we are seeing the harsh reality of this mismanagement by a government that has been fixated on one issue and one issue only. The total cut to the Education budget sits at £1.489m over the next year, once we factor in this most awful additional cut to the vital supply teacher budget, which given the number of teachers who have been absent over the past 12 months due to stress, makes this attack on a dwindling budget, incomprehensible. In December, I attended an EIS public meeting, held here in Glenrothes, it was a shame that none of the joint Administration councillors were able to attend and listen to the very real concerns being expressed by teaching staff, parents and also some pupils. 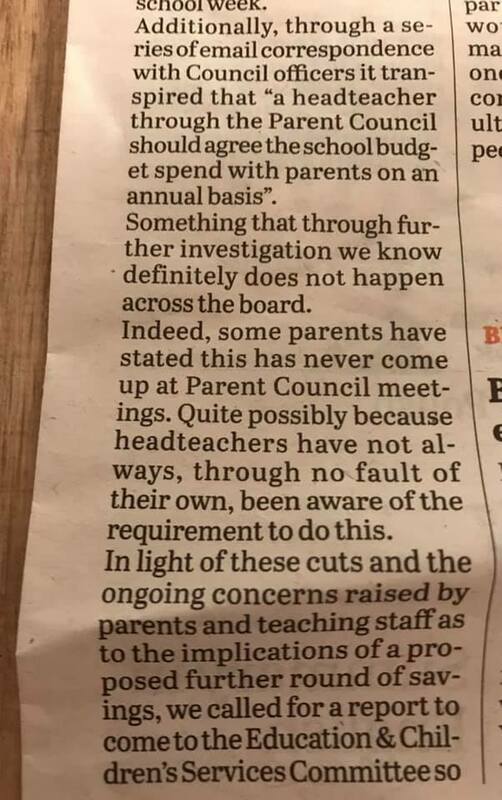 Around the same time a joint statement was issued by eight Parent Councils from Fife secondary schools such were the major concerns about any further cuts to school budgets. The key worries were cuts to staffing that would in turn lead to further limitations being placed on choice within the curriculum in the senior phase. 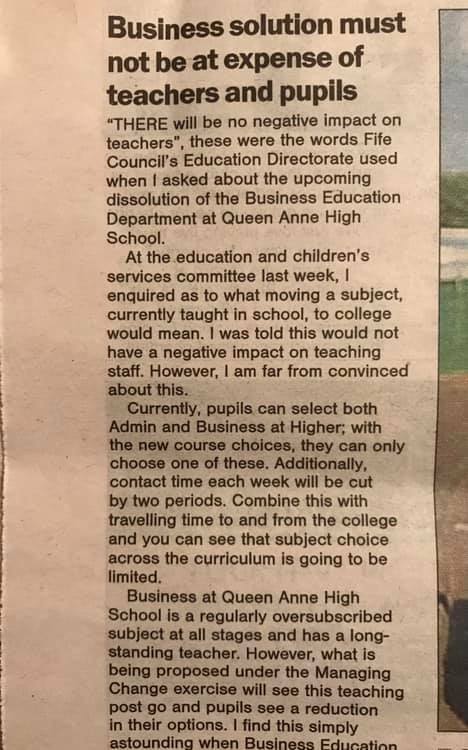 For example Queen Anne High School has had a long established and regularly over-subscribed Business Education Department. However, it was early on earmarked for closure which seems incredible given it currently offers a senior phase curriculum that includes Business Management, Administration, Travel & Tourism and Financial Services at both National and Higher. Now this budget cut the department will see the PT post removed and the BGE phase being placed in the curriculum area of Woodwork and Engineering Science. What though of the senior phase? Well we know the course choices form tells pupils they are going to College to study these subjects. 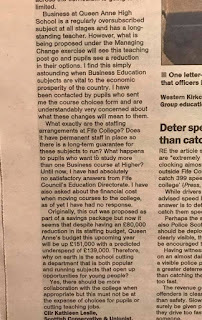 It is just rather inconvenient that when I contacted Fife College I was advised that they do not have National 5 & Higher Business Administration and Business Management on their timetabled classes for the Autumn term and as we now know they won’t be sending college staff into school to teach these subjects. Therefore, we have an impending department closure and no answer if pupils will even be able to take up their subject choices, which incidentally will have a knock-on effect when it comes to applying for university. Another major concern is the removal of two PT Guidance posts from Balwearie. It is difficult to put into words the importance of having sufficient Guidance staff in school. Whilst one part of the role is to work with pupils on curricular and career guidance the other part is to create a link, that lasts throughout a pupil’s time in school, whereby they are assured of confidential personal and emotional support. In short, they offer a space of continuity where trust can be built. The concept of any high school having to cut vital Guidance posts when mental health issues and stress amongst young people continues to increase, is deeply worrying and for this Administration to be signing off on such cuts to education they really need to think about the impact of these on every single young person. This is not getting it right for every child. Far from it. I have met and spoken with a number of HTs and teachers over the past number of months and the message that kept coming back was – we cannot take another cut. We have already cut right back. Removing more promoted posts and merging departments into a single faculty may look great on paper but the reality is it leads to subject limitations on pupils and as one HT pointed out – we thought we had moved away from this idea of pushing kids towards subject areas that do not interest and engage them. The outcome of these cuts means where a pupil is keen to select a range of practical subjects they will be unable to as class sizes have to be smaller. This is not getting it right for every child. This is storing up future problems. The second part to this cut is what it will do to teaching staff. At a time where morale is already at rock bottom among teachers, with around 10% of probationers leaving the profession and around 40% considering quitting, another attack on education is not what is needed. It is worthwhile remembering that a full-time teacher, whether in the classroom or an HT, is contracted to 35 hrs per week. Yet a recent survey by the EIS found that 28.9% do between 5 & 7 extra hours per week and 34.9% more than 8 extra hours per week with 15% saying they feel stressed all the time. 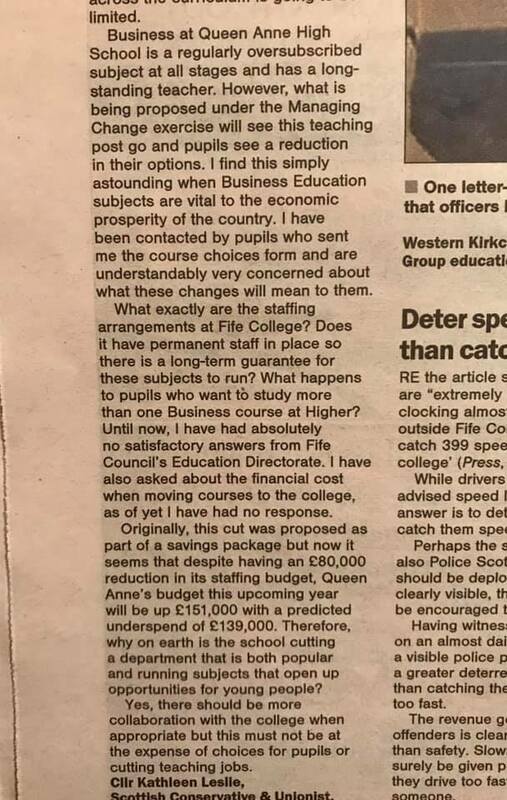 The solution here in Fife by this SNP-Labour coalition appears to be to ensure that workload increases, stress increases, and promotion opportunities are limited. I would remind colleagues that this SNP Government claims “education is its number one priority”, well after the constitutional obsession that is, yet we have here a budget today that says exactly the opposite. Whilst I am in no doubt that the coalition members will vote en masse to pass it, I would suggest that the SNP stops its blame Westminster game and starts properly funding local authorities. 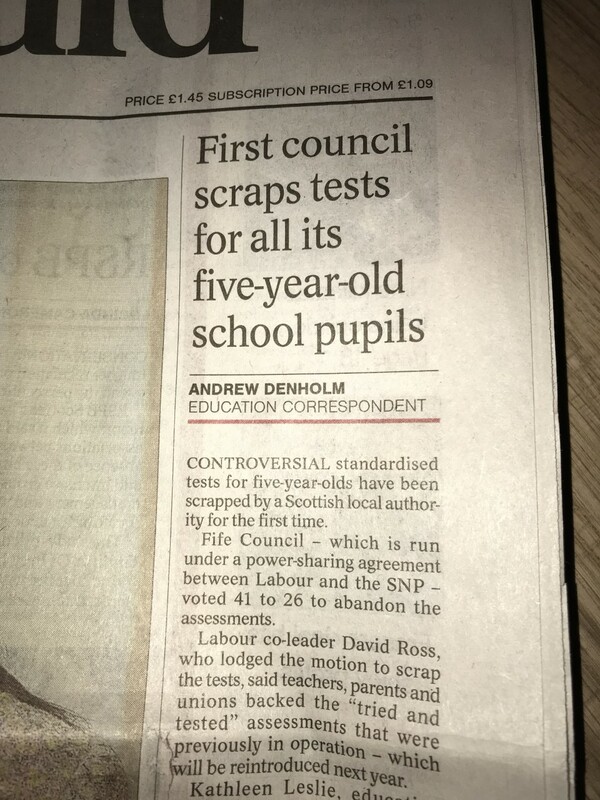 Whilst the Labour group seriously considers that in supporting this terrible offering we have here that they are doing nothing more than lending their support to the SNP Government and no longer appear to be the party that once had a half decent record on education here in Fife. This past week has been fairly busy. I have been out and about in the Ward catching up with residents, including getting feedback on the poorly advertised changes to bin calendars over the Christmas period. I have also been to a number of meetings including the first Invertiel TRA of the year - one of my favourite meetings. An informative Q&A session was held with the Scouts in Burntisland and finally there is a resolution to the long-running saga of the fence around the viaduct. All that must wait for another post though. The Scottish Government set its budget last week, relying on the support of the Greens. It's a budget to hammer all hardworking Scots. Council tax increases, proposed parking charges at work and cuts to local authorities. The SNP at Holyrood may claim to be funding local authorities sufficiently but this is absolute nonsense, we have so much ring-fenced money now (read - top-down centralisation) that local authorities are having to cut back and cut back. If there is any austerity in Scotland it is the making of this SNP government. 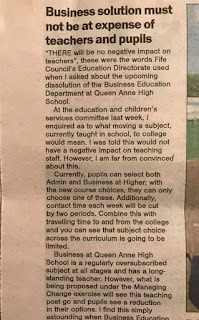 “There will be no negative impact on teachers”, these were the words Fife Council’s Education Directorate used when Cllr Kathleen Leslie asked about the upcoming dissolution of the Business Education Department at Queen Anne High School. “At the Education & Children’s Services Committee last week I enquired as to what moving a subject, currently taught in school, to college would mean. I was told this would not have a negative impact on teaching staff. However, I am far from convinced about this” said Conservatives Education Spokesperson, Cllr Leslie. At last week’s Education & Children’s Services Committee Cllr Dave Dempsey and I put forward a motion calling for greater transparency and scrutiny of secondary school budgets. 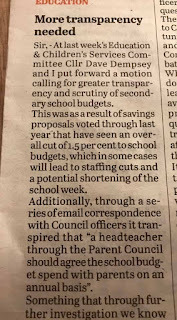 This was as a result of savings proposals voted through last year that have seen an overall cut of 1.5% to school budgets, which in some cases will lead to staffing cuts and a potential shortening of the school week. 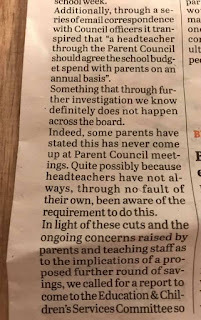 Additionally, through a series of email correspondence with Council officers it transpired that “a headteacher through the Parent Council should agree the school budget spend with parents on an annual basis”. Something that through further investigation we know definitely does not happen across the board. Indeed, some parents have stated this has never come up at Parent Council meetings. Quite possibly because headteachers have not always, through no fault of their own, been aware of the requirement to do this. In light of these cuts and the ongoing concerns raised by parents and teaching staff as to the implications of a proposed further round of savings, we called for a report to come to the Education & Children’s Services Committee so that this could be discussed in a public forum. 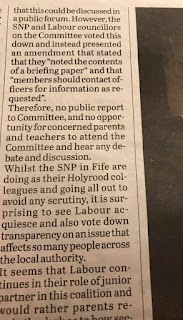 However, the SNP and Labour councillors on the Committee voted this down and instead presented an amendment that stated that they “noted the contents of a briefing paper” and that “members should contact officers for information as requested”. Therefore, no public report to Committee, and no opportunity for concerned parents and teachers to attend the Committee and hear any debate and discussion. 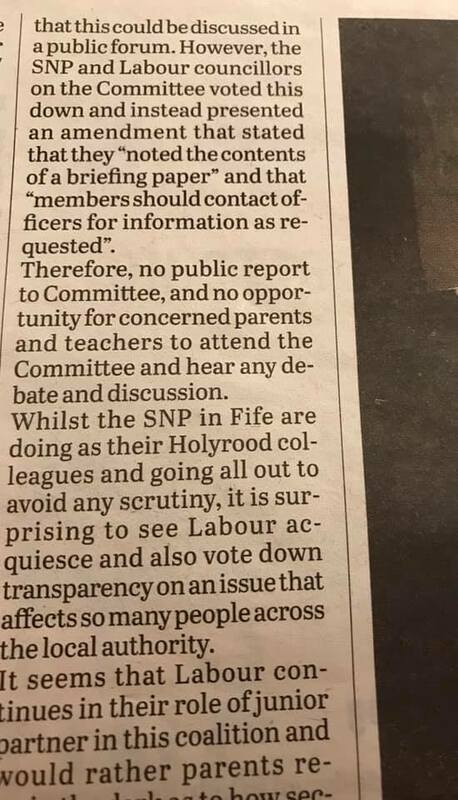 Whilst the SNP in Fife are doing as their Holyrood colleagues and going all out to avoid any scrutiny, it is surprising to see Labour acquiesce and also vote down transparency on an issue that affects so many people across the local authority. 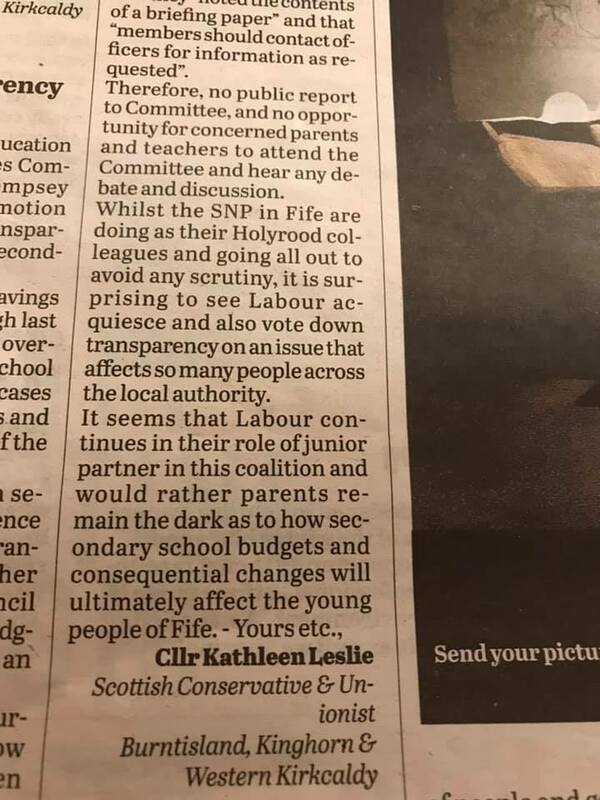 It seems that Labour continues in their role of junior partner in this coalition and would rather parents remain the dark as to how secondary school budgets and consequential changes will ultimately affect the young people of Fife. Thursday's full Council meeting saw Fife vote to withdraw from P1 SNSA. After a process that saw a vote to withdraw back in October, which was then overturned at the Education & Children's Services Committee then following a call-in to the Scrutiny Committee by my colleague Cllr Richard Watt we got to last Thursday. Going through the debate again and questions being asked of lead officers who attended the Council meeting a vote was held. 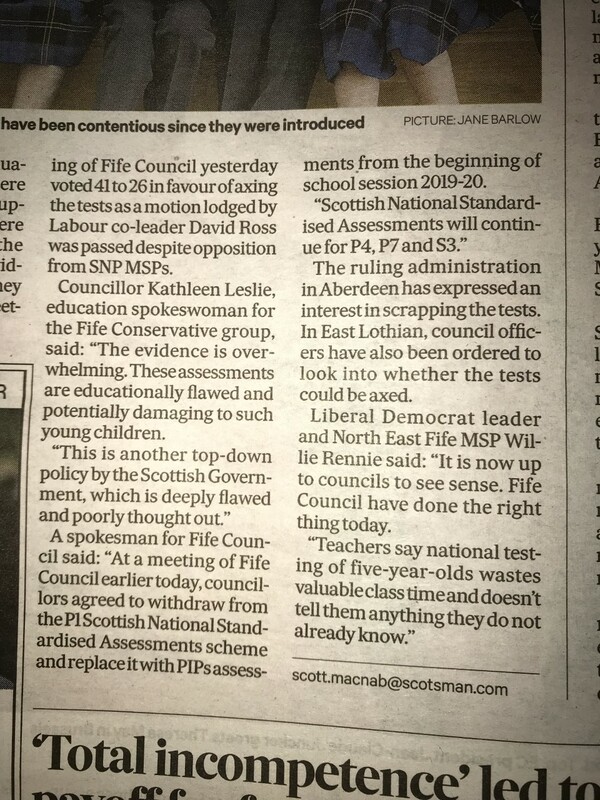 Tabled by the Labour group and agreed by the rest of us, with the exception of the SNP, Fife Council vote to withdraw the testing of Primary 1 children using this method of assessment. Below is the text of what I said on Thursday followed by some links following the vote. I absolutely believe this was the correct decision. The more that I researched this the more convinced I have become that no Primary 1 pupil should be sitting a numeracy assessment of 32 minutes and a literacy assessment of 44 minutes. This goes against the philosophy of Curriculum for Excellence and is not conducive to the learning of such a young child. Today, for the fourth time I am speaking out against P1 SNSA. Having spent a considerable of time these past couple of months reading the evidence, which continues to grow, as to why these assessments are completely unsuitable, educationally flawed and potentially damaging to the well-being of Primary 1 children, I am yet further persuaded that we must halt SNSA for P1 now. There are two parts to what I will say today. 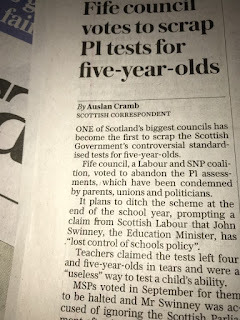 The first being the case against SNSA for P1 and the second why I believe Fife Council can withdraw from these assessments. Play Scotland has stated that it is “tests of opportunities, exploration and everyday adventures” that matter not academic tests in Primary 1. One of the earliest documents produced for the Early Years was Building the Curriculum 2 which stated “A key message is that approaches to fostering learning need to be flexible to take account of the needs of the child, and will change as children develop”. Unfortunately, these assessments are not flexible and they take up time where tests of opportunities and exploration could be taking place instead. Even worse, feedback from teachers in Fife released under the FOI have cited that alignment with Experiences & Outcomes and the benchmarks for P1 are difficult to see and that “assessments are narrow and do not reflect the principles of CfE”. Very explicit examples of concerns about SNSA here in Fife are within the 700 pages of the FOI request. I would urge that you look at it. Is it any wonder? On the Scottish Government’s own User Review, the average time for the assessments are 32 mins for numeracy and 44 mins for literacy. How are these administered in a busy classroom of 30 P1 children? 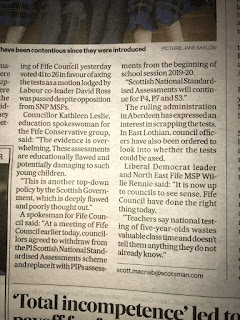 In Fife, despite claims of no assessment windows, the feedback is clear “tests carried out en masse” and “The Council set out the timings” continuing “It was decided by management with minimum notice given to staff”. “All pupils have to complete them in May regardless of readiness” – that confirms what the Scottish Government’s User Review states – that 16,000 assessments were taken in one day in May across the country. Others commented the impact on learning and teaching with a SFL teacher having to take groups of children to do the assessments. The amendment passed in this Chamber in October requested a report be brought to the Education & Children’s Services Committee outlining if withdrawal from the assessments in P1 was possible. A report was duly presented, containing, I might add, a fair bit of content that was completely irrelevant to the question being asked. We were presented with “positive” and “less positive” takes on the assessments, along with how many children had sat the assessment and how many had been withdrawn – 1 child, but that may be because a survey carried out by Connect found that 70% of parents had no idea their child was sitting an SNSA. Is it possible? There is nothing in the report to suggest it is not possible. Having sought legal advice, the Directorate notes there are two key points to consider. The first is that there is “there are no specific regulations enacted or statutory guidance issued imposing a legal duty to carry out P1 SNSA.” Instead it was “anticipated that education authorities would therefore adopt the assessment scheme without the need for regulations imposing these”. 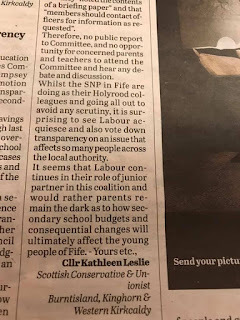 That of course would require an amendment to the Education Act as the Education Secretary in his missive to local authorities of 4thSeptember provides advice that “SNSAs, in common with virtually all aspects of the Scottish curriculum and its delivery, are not provided for in legislation. This means that they cannot be seen as compulsory”. The Directorate’s own response notes that P1 “SNSA appears to be the least strong and effective of all the year groups at which SNSA is undertaken”. It also states that “a significant number of schools remain to be convinced of the immediate advantages of using SNSA at P1”. Leading to the question that does any of this constitute a need to withdraw or is it about identified areas for improvement? What is this improvement? The Scottish Government has made much of the fact that around one third of questions will be replaced – an improvement? Possibly, but that was already in the pipeline long before the User Review so they knew something was not working. Secondly, the idea of replacing “problematic” questions, or what could be described as teething problems could be argued as a case to continue if it weren’t for the fact that thousands of these assessment questions were already carried out with children prior to SNSA going live. The User Review also suggests there could be better ways of “incorporating the SNSA into the teaching”. Thereby, inferring there must be something wrong with the current implementation by class teachers. Does Fife have an alternative means of assessing the children it is obliged to educate? Yes, it does. A tried and tested method which not only assessed literacy and numeracy as SNSA does but which looked at cognitive, physical and emotional development in a child in P1, these tests were also far shorter. The report claims that the new assessment will produce potentially highly valuable information that will accord with national standards. However, it is difficult to feel at all convinced by this claim when Scotland’s largest teaching union states that at best they assess between 5% and 10% of the skill set covered in P1. The tests are being carried out in the most part near the end of the year by which time class teachers will have used numerous other assessment methods and therefore forms no baseline. That is not GIRFEC and it is not what the play-based learning philosophy of Curriculum for Excellence was ever supposed to be about. 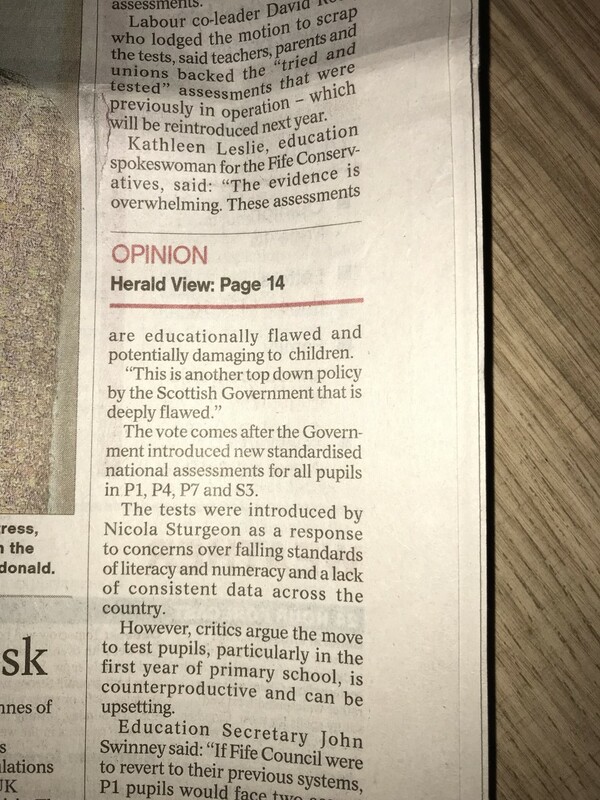 These assessments by their very name “standardised” and “national” indicate they are just a huge data gathering exercise by the Scottish Government which puts both teachers and pupils under pressure. Pressure that no 5 year-old, should be facing. I support the motion. Following writing about the Council motion and amendments to request Fife withdraw from SNSA in P1 - due to the many and varied reasons expressed by teaching staff, headteachers, unions and parents across Scotland and the 700+ responses released in the Freedom of Information request, seeing the Council decision to withdraw voted down at the Education & Children's Services Committee (E&CS), we reached today (still with me?). * This Committee notes a decision of full Council in regard to SNSA assessment in P1 in Fife and agrees to suspend undertaking SNSA P1 pending the outcome of the National Review. * Committee recommends to the Scottish Government as part of the Review all P1 staff should be consulted and allowed to contribute anonymously. * That Fife has a positive record on education and raising attainment. * The Committee agrees to return to the PIPs assessment in Fife. The motion passed at the E&CS Committee arrived at the Scrutiny Committee due to my colleague Cllr Richard Watt requesting a call-in following that decision. This required the support of 20 councillors, which he received (cross-party). Therefore, it had to be discussed further. This morning the Scrutiny Committee met and although I am not a member of that Committee I was nominated to speak in place of the person who placed the call-in. I was given 5 minutes to present, what I (and others) believe are the arguments against P1 SNSA, the content of the officers report to the E&CS Committee - and the potential implications (or otherwise) if Fife was to withdraw. The amendment at full Council in October requested that Fife withdraw, if possible. It asked for a report by officers on this. We were presented with a report which nowhere said we could not withdraw. There was a discussion around the legal framework, if somewhat ambiguous in places, it did not anywhere say it was not possible to withdraw. 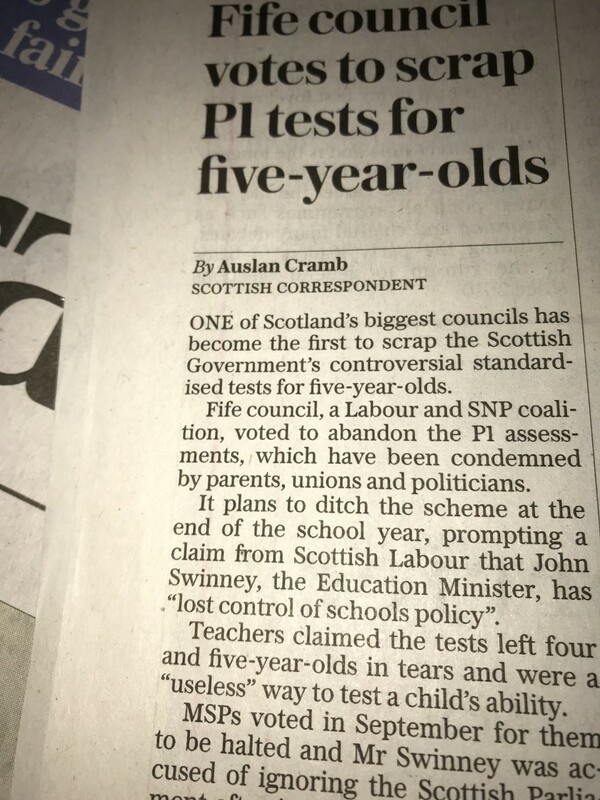 We know that not all local authorities are carrying out these tests but more to the point there is nothing in the legislation that makes such assessment compulsory (this was clarified in the Scottish Government's own missive to local authorities in September). The motion noted noted that it disagreed with the E&CS Committee decision and referred it back to full Council. I believe this was the correct outcome and I thank all councillors who supported and voted for this motion and all those who supported the call-in. Here are some of the key points from this morning - the text of what I said to the Scrutiny Committee follows (and covers in more detail). 1. An argument was presented that 1,872 pupils had not yet sat SNSA in P1 and would somehow "miss out" - my response is - if something is not working then you do not continue with it for the sake of continuing. Secondly, SNSA only assesses around 5% of the CfE level data. 2. The data is passed back to teachers - we know this does not always happen. We also know that parents, in surveys conducted, have noted that they are often in the dark about this assessment - one survey showed 70% of parents did not know when their child was doing SNSA. 3. There was a comment that the data was for here in Fife and not going back to the Scottish Government - if that is the case then why was it stated that Fife feeds in around 7% of the data and why call it "standardised" if it is not? One of the key points previously made was this would provide data for the national picture - so which is it? Does it or does it not? 4. 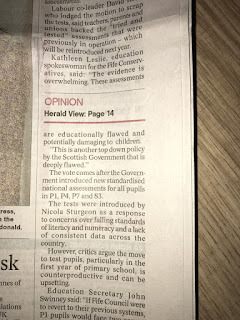 The tests can be done anytime and don't take too much time - on the Scottish Government's own User Review it states that literacy takes an average of 44mins and numeracy 32mins - revealing why they have taken up so much time, keeping a P1 sitting for that long is not an easy feat for anyone. 5. 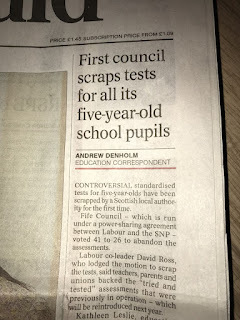 There was a comment that "improvements" could be made - lets remember this - thousands of trial test questions were run in schools prior to the roll-out. Any problems should have been flagged up then. Additionally, the point was made that the User Review was replacing questions but this was being done prior to that so that is not an argument. 6. In addition to me presenting, the Convenor of the E&CS Committee also did as did an EIS representative and then members of the Committee were invited to ask questions of us and of officers. It then proceeded to a motion and amendment. The motion was presented by the Labour group and supported by 3 of the 4 political groups, the SNP presented an amendment - keen were they to hold-up another half-baked and failing policy by their political leaders at Holyrood. 7. 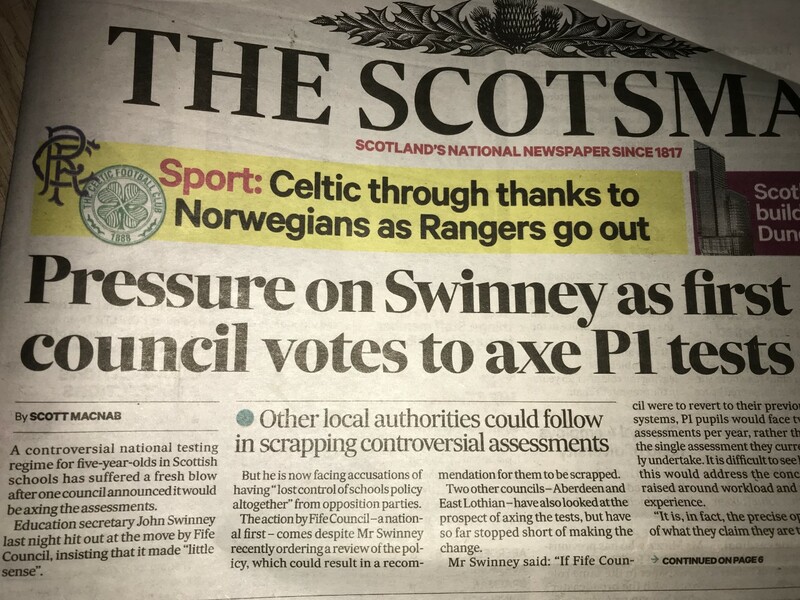 That the cross-party vote at Holyrood was irrelevant to this - no, that was due to the evidence that MSPs had (and which continues to grow) - as councillors, we are also representing the electorate and the majority of the electorate here in Fife voted for parties which do not support P1 SNSA. On 6th November the Education & Children’s Services Committee examined the agenda item on SNSA following an amendment passed at Council on 4thOctober. This amendment was supported by 3 of the 4 political groups and called for a withdrawal of participation in SNSA for P1 children, if possible. This decision was based on growing international evidence, the voices of classroom teachers and some SMT that had been shared in an FOI request, written and verbal communication with elected representatives across Scotland, dialogue with trade unions and organisations such as Upstart Scotland and Connect (Scottish Parent Teacher Council). I would ask that you look at the feedback – this is only one example of many. There were 4 points to the amendment which was duly voted for by a majority of councillors. For the purposes of today the second and third bullet points, as referenced in these papers at 1.2 & 1.3 will form the basis of the argument that the decision made at Committee was incorrect. 1.1 notes play based assessment and 1.4 was a request made on which I am sure we are all looking forward to being briefed on at the next Council meeting. 1.2. noted concerns raised by teachers and parents about the introduction of SNSA, the view of the Scottish Parliament and already adopted approaches to assessment in Fife. If we examine the report brought to Committee 2.1.3 states around one third of primary HTs were asked to respond to the experiences in their schools. 2.1.5 & 2.1.6 provide a carefully selected list of “positive” and “less positive” responses. What the report does not provide is explicit concerns of parents and teachers – “less positive” could imply “negative” but are a world away from the feedback in the FOI – a quote in it from Fife which possibly gives a little insight is “dreadful. A serious impact. We struggled for weeks”.Or another “literacy was far too difficult and not in line with benchmarks”.And “there was far too much reading before a question was asked”. This was passed by all opposition parties in the Scottish Parliament – or to put it another way – it was passed by those representing over 50% of the electorate. Yet, this local authority report fails to make mention of the vote by Scotland’s parliament. 1.3 is where we get to the nub of the matter. At full Council the majority of councillors voted that they “believe(s) that Fife should withdraw from participation in SNSA for P1 children” – that is explicit. This statement added the postscript “if possible” – is it possible? Yes, the Directorate frames this in its own response. Having sought legal advice there are two key points they note. The first is that there is “there are no specific regulations enacted or statutory guidance issued imposing a legal duty to carry out P1 SNSA.” Instead it was “anticipated that education authorities would therefore adopt the assessment scheme without the need for regulations imposing these”. 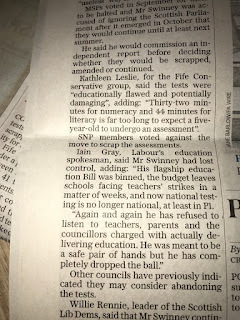 That of course would require an amendment to the Education Act as the Education Secretary in his missive to local authorities of 4thSeptember provides advice that “SNSAs, in common with virtually all aspects of the Scottish curriculum and its delivery, are not provided for in legislation. This means that they cannot be seen as compulsory” – 1.3 asks to halt P1 SNSA if possible – clearly it is. The Directorate’s own response notes that P1 “SNSA appears to be the least strong and effective of all the year groups at which SNSA is undertaken”. It also states that “a significant number of schools remain to be convinced of the immediate advantages of using SNSA at P1”. It does not state that withdrawal would not be a reasonable and proportionate step. More evidence would need to have been provided. To conclude – “Council believes that Fife should withdraw from participation in SNSA for P1 if possible” – there is nothing in this report to state it is not possible.